Jane Addams was called the "beloved lady" of American reform. She was a social worker, reformer, and pacifist. One of her most important accomplishments was to create a settlement house, a center that provides services to members of a poor community. Addams founded the most famous settlement house in American history, Hull House, in Chicago, Illinois. 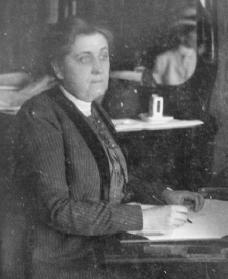 Jane Addams was born in Cedarville, Illinois, on September 6, 1860. She was the eighth child of John Huy Addams, a successful miller, banker, and landowner. She did not remember her mother, who died when she was three years old. She was devoted to and deeply influenced by her father. He was an idealist and philanthropist who served as state senator of Illinois from 1854 to 1870. Although Addams became an activist for the poor, she herself came from a prosperous family. As a young woman she attended Rockford Female Seminary in northern Illinois. There she was not only a fine student but also the class president for four years and the editor of the school magazine. Addams also developed an interest in the sciences, even though such studies were not stressed at the school. After her graduation in 1881 she entered the Women's Medical College in Philadelphia, Pennsylvania. However, after six months she was forced to end her studies to have a spinal operation. Addams was never quite free of illness throughout her life. It took Addams a long time to recover from her operation. During this time she fell into a deep depression. This was partly because of her illness and partly because of her sensitivity to the way women of her status were expected to live in nineteenth-century America. Intelligent middle-class women like Addams were frequently well educated. However, they were expected to live simply as wives and mothers within homes dominated by men. Society discouraged women from putting their talents to use outside the home. Addams traveled in Europe between 1883 and 1885 and spent winters in Baltimore in 1886 and 1887. During this time she searched for comfort in religion. However, she did not find a satisfactory outlet for her abilities until she made a second trip to Europe in 1887. At this time she visited Toynbee Hall, the famous settlement house in London, England. Toynbee Hall was a social and cultural center in the slums of the East End neighborhood in London. It was designed to introduce young men who wanted to join the ministry to the world of England's urban poor. Addams thought it would be a good idea to provide a similar opportunity for young middle-class American women. She decided "that it would be a good thing to rent a house in a part of the city where many … needs are found." She especially wanted to provide opportunities for well-educated young women to "learn of life from life itself." Hull House was located in one of Chicago's poorest immigrant slums. Addams originally thought Hull House would provide a service to young women who wanted more than a homemaker's life, but it soon developed into a great center for the poor of the neighborhood. Hull House provided a home for working girls, a theater, a boys' club, a day nursery, and numerous other services. Thousands of people visited Hull House each year. It became the source of inspiration for dozens of similar settlement houses in other cities. Its success also made Addams famous throughout the United States. She became involved in an attempt to reform Chicago's corrupt politics. She served on a commission to help resolve the Pullman railroad strike of 1894. Addams supported workers' rights to organize and spoke and wrote about nearly every reform issue of the day. Her topics ranged from the need for peace to women's right to vote. Addams served as an officer for countless reform groups. These groups included the Progressive political party and the Women's International League for Peace and Freedom. She served as this group's president in 1915 and attended international peace congresses in a dozen European cities. Addams gained a reputation as a pacifist (a person who is against conflict and war). She won the Nobel Peace Prize in 1931. Addams also wrote books on a wide range of subjects. Her achievements gained her honorary degrees from several universities and made her an informal adviser to several American presidents. She died on May 21, 1935, in Chicago, Illinois. Addams, Jane. Forty Years at Hull-House. New York: Macmillan, 1935. Davis, Allen F. American Heroine. New York: Oxford University Press, 1973. Polikoff, Barbara Garland. With One Bold Act. Chicago: Boswell, 1999.